The function of transmission is to transfer engine power to the differential, which in turn is transmitted to the wheels. Transmission incorporates the differential and axel, which cumulatively are known as transaxle, and is mostly installed in front wheel drive vehicles. Different types of automatic transmissions are utilized in modern cars. Modern cars mostly employ computer controls to engage gears according to the speed of the vehicle. Extensive utilization of computer controls and increased four speed to eight speed transmission gearbox enhances the efficiency of modern vehicles. Adoption of continuously variable transmission (CVT) and automated manual transmission (AMT) types is increasing significantly owing to the high demand for fuel-efficiency. Comfort and ease of driving are key factors that are likely to increase the demand for automated manual transmission in commercial vehicles and hatchbacks. Furthermore, cost of automated manual transmission is low, as compared to those of other types of transmission. Consequently, the overall cost of the vehicle is highly competitive and hence, automated manual transmission is gaining popularity among vehicle manufacturers and consumers. 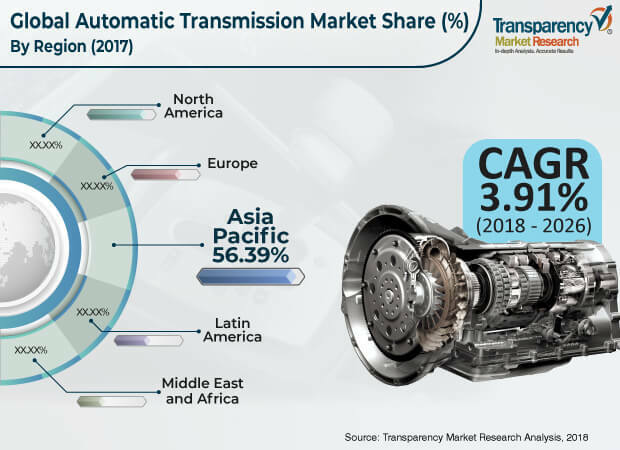 Rising congestion in urban areas, growing demand for fuel-efficient vehicles, and adoption of latest technologies by automakers are anticipated to drive the global automatic transmission market during the forecast period. Growing environmental concerns and demand for clean exhaust along with maximum fuel efficiency are likely to propel the CVT segment of the automatic transmission market during the forecast period. Major automakers such as Hyundai, Nissan, and Toyota are adopting continuously variable transmission, which is likely to rise significantly during the forecast period. Rise in vehicle production in developing countries due to increase in per capita income, rapid urbanization, and availability of vehicle loan with minimum interest are boosting vehicle production. This, in turn, anticipated to drive the automatic transmission market during the forecast period. The global automatic transmission market has been segmented based on transmission type, vehicle, and region. In terms of transmission type, the global automatic transmission market has been classified into conventional automatic, automated manual transmission (AMT), continuously variable transmission (CVT) and others. Conventional automatic transmission is generally connected to the engine with the help of a hydraulic torque convertor, which generates maximum torque; however, it is unable to generate efficient revolution per minute, as compared to continuously variable transmission (CVT). Furthermore, optimum fuel efficiency offered by CVT along with stringent emission norms and demand for clean environment are likely to boost the demand for CVT during the forecast period. Incorporation of electronic sensors, pneumatics, and actuators in automated manual transmission enable smooth shifting of gears by using computers. Furthermore, availability of AMT at a competitive price, shifting of preference of commercial vehicle manufacturers toward AMT are expected to boost the demand for AMT during the forecast period. Sales of passenger vehicles is increasing rapidly globally owing several factors such as increase in per capita income, rapid urbanization, and emerging economies. Passenger vehicles comprise different class of vehicles such as hatchbacks, sedans, and utility vehicles. Adoption of modern types of transmission is significant in passenger vehicles owing to the availability of most advanced transmission by major transmission manufacturers such as Allison transmission, ZF group, and BorgWarner. Demand for fuel-efficient passenger cars and stringent emission norms are prompting manufacturer to adopt automatic transmission in order to cater to the demand. Consequently, the passenger vehicle segment is anticipated to expand significantly during the forecast period. Driving comfort, technology improvement, and ease of driving are expected to drive the demand for automatic transmission in light commercial and heavy commercial vehicles. Prominent regions considered for the analysis include North America, Europe, Asia Pacific, Middle East & Africa, and Latin America. Regional level analysis has been conducted on the basis of vehicle production, technology adoption rate, GDP, presence of OEMs, and society demand. Asia Pacific is anticipated to hold a major share of the global market during the forecast period. Some countries in Asia Pacific witness low penetration of automatic transmission; however, the rate of adoption of latest technology is likely rise in these countries in the near future, which in turn is anticipated to drive the automatic transmission market in the region during the forecast period. Furthermore, rising adoption of premium vehicles in China, India, and Japan along with the presence of manufacturing plants of major transmission manufacturers are expected to boost the market during the forecast period. However, vehicles in North America mostly employ conventional automatic transmission and hence, North America held second position in terms of share of the global market. Key companies operating in the global automatic transmission market are expected to gain advantage from new research & development in collaboration with other global vehicle manufacturers. Major players operating in the global automatic transmission market include AISIN SEIKI Co., Ltd., Allison Transmission Inc., BorgWarner Inc., Eaton, JATCO Ltd. Magneti Marelli S.p.A, Voith GmbH & Co. KGaA, ZF Friedrichshafen AG, Magna International Inc., Schaeffler Technologies AG & Co. KG, EXEDY Corporation, GKN PLC, and WABCO. This report analyzes and forecasts the global automatic transmission market at the global and regional level. The market has been forecasted, based on value (US$ Mn) and volume (million units) from 2018 to 2026. The study includes drivers and restraints of the global automatic transmission market. It also covers the impact of these drivers and restraints on the demand for automotive transmission during the forecast period. Furthermore, the report highlights opportunities in the global automatic transmission market at the global and regional level. The report comprises a detailed value chain analysis, which provides a comprehensive view of the global automatic transmission market. The Porter’s Five Forces model for the global automatic transmission market has also been included to help understand the competitive landscape of the market. The study encompasses market attractiveness analysis, wherein all segments are benchmarked based on their market size, growth rate, and general attractiveness. The study provides a decisive view of the global automatic transmission market for vehicles by segmenting it in terms of transmission type, vehicle, and region. These segments have been analyzed based on present and future trends. Regional segmentation includes the current and forecast demand for automotive electronics control management in North America, Europe, Asia Pacific, Latin America, and Middle East & Africa. The report also covers demand for individual application segments in all the regions. The study includes profiles of major companies operating in the global automatic transmission market. Key players in the market include AISIN SEIKI Co., Ltd., Allison Transmission Inc., BorgWarner Inc., Eaton, JATCO Ltd. Magneti Marelli S.p.A, Voith GmbH & Co. KGaA, ZF Friedrichshafen AG, Magna International Inc., Schaeffler Technologies AG & Co. KG, EXEDY Corporation, GKN PLC, and WABCO. Market players have been profiled in terms of attributes, such as company overview, financial overview, business strategies, recent developments, and manufacturing footprints. The market for automatic transmission is primarily driven by an increase in the demand for fuel-efficient vehicles across the globe. The report provides the estimated market size of automatic transmission for 2017 and forecast for the next nine years. The global market size of automatic transmission has been provided in terms of revenue and volume. Market numbers have been estimated based on key transmission type and vehicle for regional segments of the global automatic transmission market. Market size and forecast for each major transmission type, and vehicle have been provided in terms of global and regional/country markets.